The steading roof has collapsed sparking fears the building might collapse onto the road. A search is underway for the owners of a dilapidated barn left badly damaged after a car crashed into it. 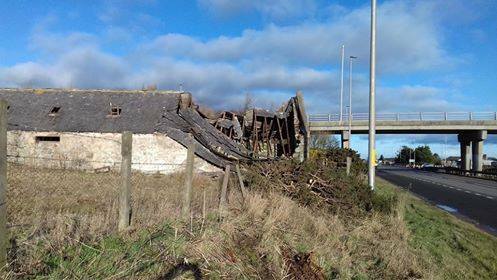 The building, which is located near the Newtonhill flyover on the northbound stretch of the A92 Stonehaven to Blackdog road, has been abandoned for many years. The roof on the former steading was already partially caved in but last week a vehicle reportedly veered off the road and crashed into its side, causing it to collapse. Roads bosses were alerted to the issue by North Kincardine councillor Ian Mollison who was concerned the building might fall onto the adjacent carriageway. After examining the steading, Aberdeenshire Council’s officers deemed it was not a hazard to passing traffic. However the authority is now trying to track down the owners of the property to see what can be done with the building. And it may yet be forced to spend public money to make the structure safe. Mr Mollison said: “I didn’t see the car itself as it had been cleared away, but I saw the skid marks and the tracks where it had over the gorse. “The officers came along to check it was safe and said there were no concerns about it at this stage. They don’t think it will fall. “They are now going to find out who owns the building because they don’t necessarily have a record of everyone to hand. “It’s been derelict for many years and has gradually deteriorated over the years. There was a planning application for two houses a few years ago but that was rejected. An Aberdeenshire Council spokesman said: “We’ve assessed the damage and, although we do not consider there to be any immediate danger, we are arranging for a contractor to make the collapsed section of the roof safe and to reduce the height of the gable wall. Police had said they had received no reports of a crash at that location since February 1.